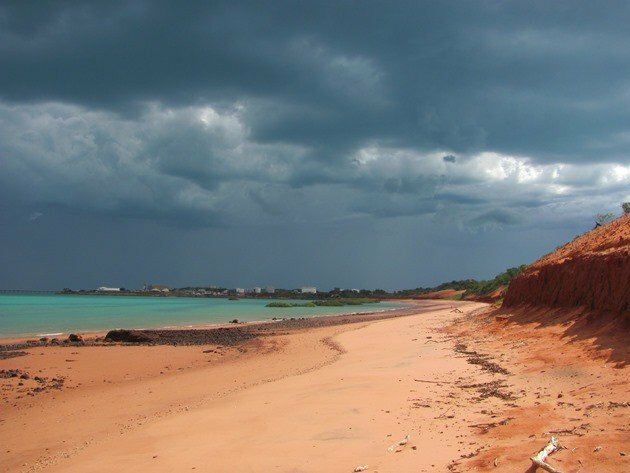 One of our favourite walks at this time of year is to walk from Town Beach in Broome to the Port in Broome and back. 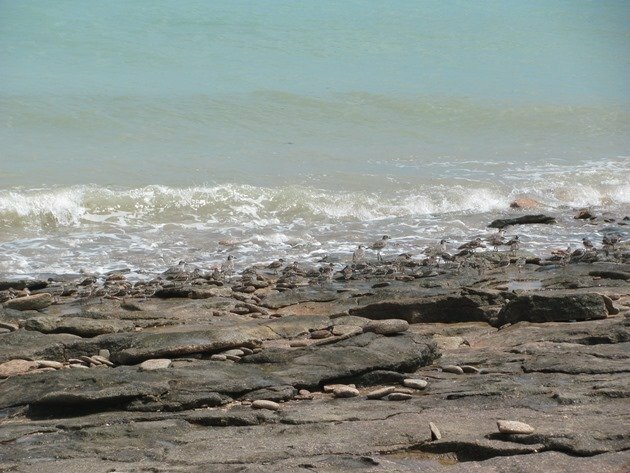 It is a walk that takes a couple of hours with spectacular views across Roebuck Bay with a red cliff backdrop and bright blue seas. The main attraction of this beach from September until April beyond the view and lack of people is the large flocks of shorebirds. The first section of the beach is a rock ledge, which makes for easy walking and runs approximately one third of the length of the walk to the Port. The following section is red sand, which can be very soft if the tide has not been high. Over the past few days the tidal movement has been almost ten metres, which is a lot of water covering a lot of mud. This is ten metres in height (33 foot), so covering approximately 1.3 kilometres (3/4 mile) of mud. You can watch the sea race back as the tide drops and the shorebirds are soon active walking out into the sea ready to feed when the mud is exposed. The weather can change quite fast at this time of year and the photo above shows what can happen at short notice along this beach and you can walk fast enough to get away from a storm……….sometimes! This beach is particularly good for Grey Plover and Ruddy Turnstone. There are often over one hundred Ruddy Turnstones hiding in the rocks at high tide and they can overlooked by their heavy camouflage. 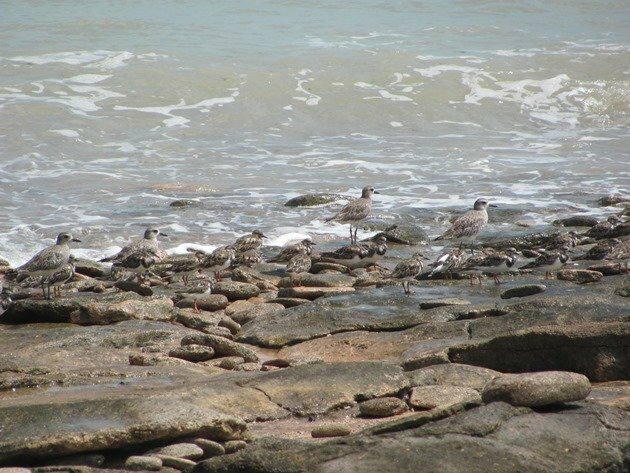 Grey Plovers tend to be in small loose flocks or solitary birds on this beach and avoid the larger flocks of shorebirds or stand on the edge of the flock. 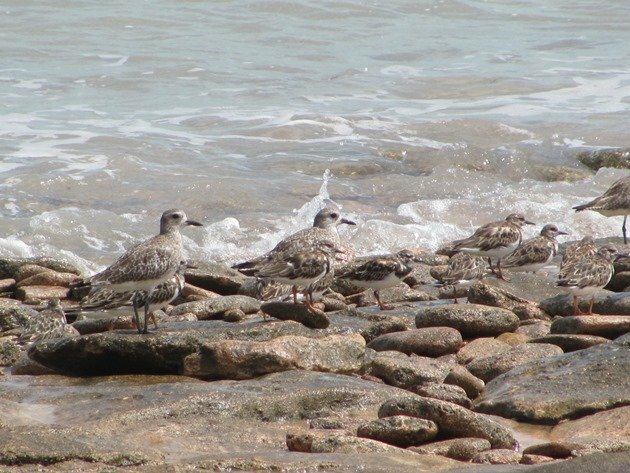 It is interesting that of all of the species of shorebirds in the Broome area the Grey Plover is a bird we don’t see lying on the beach. 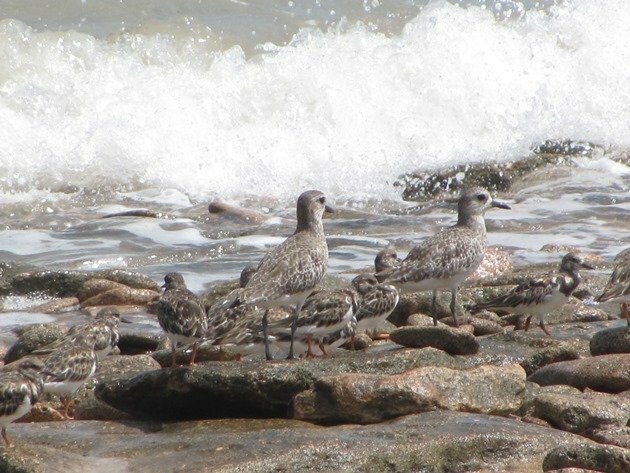 Grey Plovers are always standing or in flight, when their distinctive “black armpits” are clearly visible. At high tide and for up to two hours afterwards you will encounter Bar-tailed Godwits, Great Knots, Red Knots, Curlew Sandpipers, Grey-tailed Tattlers, Terek Sandpipers and Ruddy Turnstones lying on the wet sand, but not Grey Plovers. 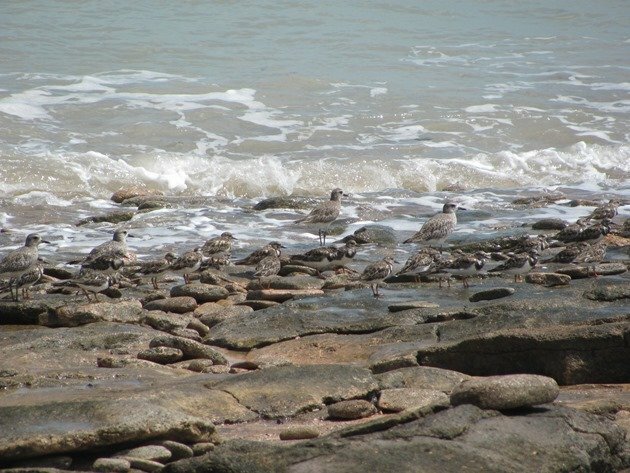 The Ruddy Turnstone flock was “given away” by the presence of a dozen Grey Plovers this week two hours after high tide. 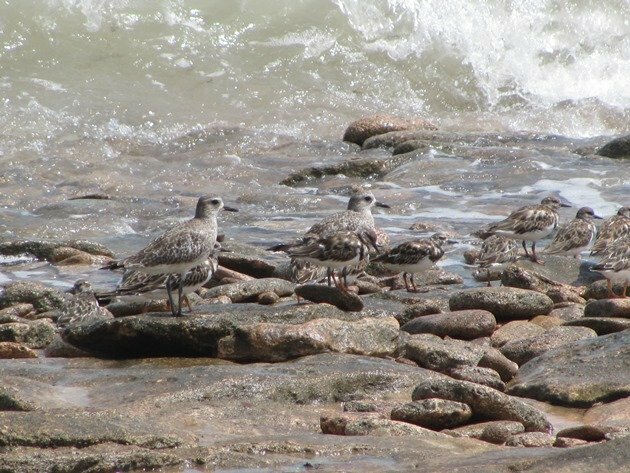 There were 141 Ruddy Turnstones hidden among the rocks and they could have easily been overlooked without the presence of the Grey Plovers….until they flew off! 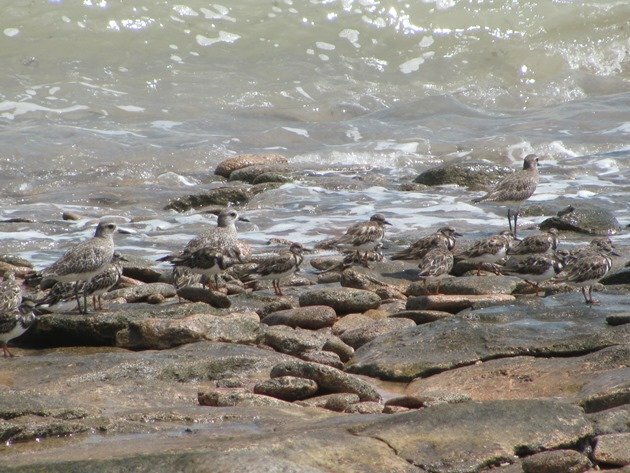 Due to the presence of the Grey Plovers we did not get as close to the flock as we could have with only Ruddy Turnstones present, because Grey Plovers are a lot more nervous of human presence. Ruddy Turnstones are active shorebirds even at high tide and are very opportunistic. While other shorebirds are roosting they are often still busy looking for food. We have observed them getting “up close and personal” with other shorebirds and actively removing from other shorebirds whatever parasites they are carrying. The other shorebirds are quite happy to tolerate the Ruddy Turnstones removing parasites and continue to roost unperturbed by the activities of the Ruddy Turnstone around their rump area. Over recent years we have also had a bad outbreak of Lyngbya in Roebuck Bay and the large clumps of it are getting caught on the shorebirds legs and feet. The only shorebirds that appear to be taking advantage of the large clumps of Lyngbya on the beach are the Ruddy Turnstones. Over recent weeks we have observed them lift the clumps of Lyngbya and throw it aside and retrieve some sort of food from beneath it. It is similar to the rock tossing and seaweed tossing that they are renowned for. So, if you are heading for Broome and you want to see some Grey Plover and Ruddy Turnstones close to town then this is the beach for you! Remember that Ruddy Turnstones do camouflage well and you may just see them fly ahead of you! 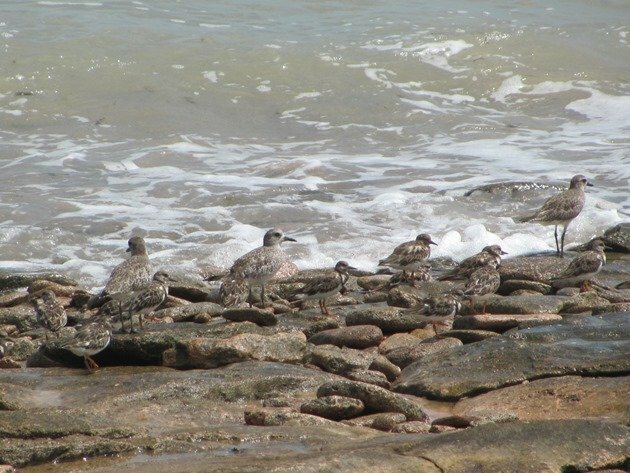 If you want to see some “up close and personal” photos of Ruddy Turnstones in another Flyway then you need to check out Corey’s post from a few years ago!